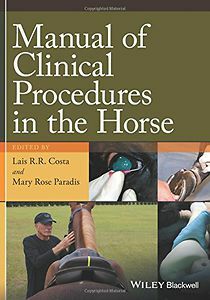 Manual of Clinical Procedures in the Horse is a detailed step-by-step guide to clinical skills in equine practice. With information on techniques ranging from physical examination and blood sampling to lameness and neurologic exams and other specialized procedures, the book is an aid to confidently and effectively performing procedures used in daily equine practice. Well illustrated with clinical photographs throughout, the book’s focus is on providing thorough, easy-to-understand descriptions of 80 techniques necessary for examining and treating horses. Each topic includes a summary of the purpose, potential complications, equipment and proper restraint for each procedure, with a detailed description of each action for the technique and the rationale behind it. More than 1,100 full-colour clinical photographs demonstrate the techniques. Manual of Clinical Procedures in the Horse is an essential purchase for any veterinary practice seeing equine patients.